You deserve world-class repairs and part quality for your personal devices, whatever form they come in. Whether it’s a broken hinge on a laptop, or a phone that just doesn’t hold a charge like it used to, we’re here to help. We’re here because we love what we do and want to share our passion with you. No longer does it make economic sense to throw away broken devices and buy new ones. 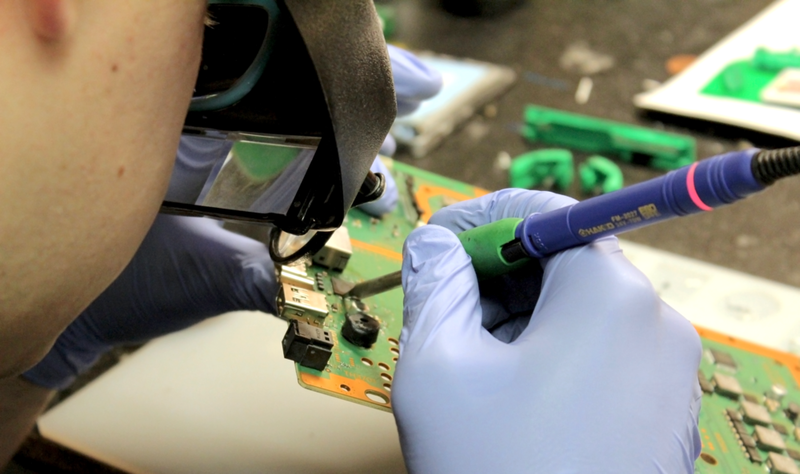 Over the past few years many technology companies have emerged to offer an alternative: device repair. Our lives are saturated with technology that seems to advance and become more sophisticated every day. Our daily activities are filled with various devices that aim to make more efficient every function we perform. Yet, these newer and more powerful devices, such as phones and tablets, are becoming more expensive not only to purchase, but to maintain and protect. Our service philosophy is simple: customize each experience to our clients’ needs and best options. Whether suggesting the proper part for a particular do-it-yourself phone repair, learning about your preferences to build that perfect computer, or guiding you in choosing between getting a phone repair or claiming insurance, Wisp seeks to be a trusted resource. Our service comes from a team with over a decade’s experience in consumer technologies. How do you distinguish part quality? Unfortunately, the industry standard is to sell copy parts: they’re extremely cheap, and many sellers are okay with the high rates of defects. And unlike other sellers, we know how to identify original and copy parts. As technicians ourselves, the time wasted and the quality lost on installing an inferior copy part is frustrating not only for us, but for our clients as well. Almost never have we seen an aftermarket part perform as well as the original, which is why we seek to provide OEM parts when they’re available. Not everyone is experienced with technology or even feels comfortable around a computer or a brand new tablet. At Wisp, we think that’s okay! We’ve all had to sit down and learn something new and after it’s done, that feeling of accomplishment is like nothing else. We’d love to be able to be a part of your learning process. Perhaps you’ve just bought a new device and want to learn all about its capabilities. Maybe you’re experienced and want to challenge yourself to a new software program. Getting ready for a job search? Have you thought about brushing up on some computer skills? We’re here to help you become an expert! Wisp was created to add transparency and client community to not only the electronics repair industry, but to the entire service industry. We don’t see people as “customers” or “consumers.”People always have been and always will be “people” or traditional “clients.” Everybody has a name, a life, hopes, accomplishments, and sometimes, they also happen to have a broken laptop screen or a dead battery. We want to hear your story and how we can be a part of it. Our goal is to offer decades’ worth of unrivaled professional knowledge, advice, service, and pricing to our clients, all while revealing how we do it---through open conversation, social networking, and blogging. Why? Because we think it’s the right thing and the fair thing to do. There is no revolving door: we are each here to stay and assist you however we can. We are motivated by developing positive relationships and listening to your constructive feedback. In a word, we are motivated by happiness. Wisp is people driven, not profit driven.